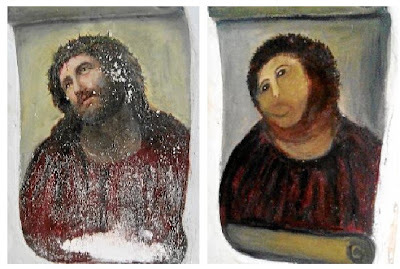 Remember the world's worst ever art restoration? In 2008, it was Sarah Palin. In 2011, it was Amy Winehouse. This year, pundits are predicting that the Halloween costume of choice will be none other than Cecilia Gimenez’s bastardized “Ecce Homo.” Widely known as “Beast Jesus,” the Spanish octogenatian’s botched restoration of a 19th-century fresco gained worldwide fame last month, just in time to inspire scores of homemade costumes like this one in advance of Halloween. If you still need help with your costume, ARTINFO has compiled three different methods to recreate “Beast Jesus” with minimal effort and maximum effect.